CNN Poll: Time to clean house in Congress? 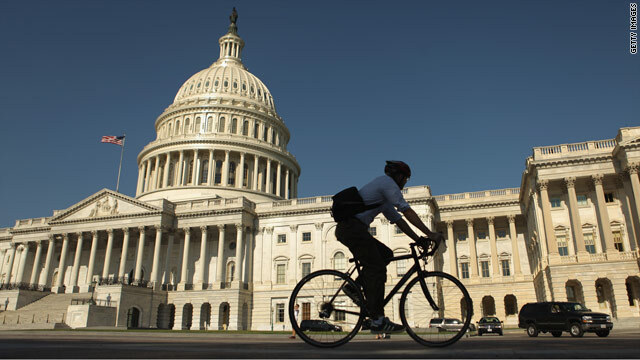 Washington (CNN) - Need more evidence that Americans are extremely angry at Congress? Well, here you go: According to a new national survey, for the first time ever most Americans don't believe their own member of Congress deserves re-election. And the CNN/ORC International Poll released Tuesday also indicates that while Republicans may have had the upper hand in the recent battle over raising the debt ceiling, they appear to have lost a lot of ground with the public and the party's unfavorable rating is now at an all time high. Only 41 percent of people questioned say the lawmaker in their district in the U.S. House of Representatives deserves to be re-elected - the first time ever in CNN polling that that figure has dropped below 50 percent. Forty-nine percent say their representative doesn't deserve to be re-elected in 2012. And with ten percent unsure, it's the first time that a majority has indicated that they would boot their representative out of office if they had the chance today. "That 41 percent, in the polling world, is an amazing figure. Throughout the past two decades, in good times and bad, Americans have always liked their own member of Congress despite abysmal ratings for Congress in general," says CNN Polling Director Keating Holland. "Now anti-incumbent sentiment is so strong that most Americans are no longer willing to give their own representative the benefit of the doubt. If that holds up, it could be an early warning of an electorate that is angrier than any time in living memory." As for all members of Congress, the poll indicates only a quarter of the public says most members of Congress deserve to be re-elected. "The Democratic party, which had a favorable rating just a couple of points higher than the GOP in July, now has a 14-point advantage over the Republican party," adds Holland. The same pattern holds for the parties' leaders in Congress. House Democratic Leader Nancy Pelosi and Senate Majority Leader Harry Reid, the top Democrat in the chamber, have never had great numbers, but the public's view of them have remained essentially unchanged in the wake of the debt ceiling debate. But House Speaker John Boehner's favorable rating has dropped 10 points, and his unfavorable rating is up to 40 percent, a new high for him. On the Senate side, Senate Republican Leader Mitch McConnell isn't faring much better - his unfavorable rating is 39 percent, a seven-point increase since July. The poll indicates that Americans' views of the tea party movement have also turned more negative, with 51 percent saying they have a negative view of the two-year-old limited government and anti-tax grassroots movement, with favorable ratings dropping from 37 percent down to 31 percent. Freshman House Republicans elected with major support from tea party activists were instrumental in keeping any tax increases out of the agreement to raise the nation's debt ceiling. The CNN poll was conducted by ORC International on August 5-7, with 1,008 adult Americans questioned by telephone. The survey was conducted both before and after Friday night's downgrading of the country's credit rating by Standard and Poor's. The poll's overall sampling error is plus or minus three percentage points. Matt, I couldn't disagree more. The Dems support big unions and trial lawyers by promising ever more expensive entitlement programs. The Tea Party, which some here seem to think is attacking the middle class, is actually saving it. They are the first political group in my lifetime that is actually trying to cut expenses. Amazingly they are doing exactly what the people who voted for them asked them to do and that is a rare, rare thing in US politics. @Pax Whitehead This was an article about Congress, not the Executive branch, and it clearly covered both Dems and the GOP in it's statements. You want the President's numbers? Look them up. They're not hard to find. To the genius that wrote "the financial day of reckoning is here", they both need to go. Quit being a party shill. We need a "US Citizens" party. Not a bunch of "lifers" who just grandstand for the next election cycle. You are part of the problem. First of all, I'm so sick of the blame game ALL politicians are constantly playing and, when the media airs the ridiculous tripe from these so-called "leaders," I just switch to a more entertaining or informative channel. I thought we elected “adults” to represent us, not jealous “children” who point the finger at each other so that mom or dad would favor one over the other!!! Our country is broken and, just as when our autos or dryers or plumbing break, we find an expert to repair it so that it will again run smoothly. Just as when we need financial advice, or marriage counseling, or any other kind of professional advice, we find the most qualified expert to advise us. Unfortunately, the "experts" we have elected to represent us in Washington are experts at power, greed, and deception and are not there for you and me...the people of America. They don't have the expertise to understand, let alone fix, the problems we have faced for decades. Nor do they know how to efficiently manage our country’s “household” so that we never face bankruptcy or a “house” that falls down around us because of lack of maintenance. They're too concerned with satisfying "the party" or getting re-elected to focus on doing the right thing. We need real experts...knowledgeable, experienced, caring, decisive expert LEADERS, not career POLITICIANS. I want to still believe that America can again be the country the world respected and admired and that we can still have the American dream our forefathers wanted. But until we repair our broken systems (and we have many), we Americans don't have much faith in today, much less our tomorrows. Someone earlier wrote "If America wants to remain viable as a country with sound fiscal management and a vibrant economy, then vote Republican." Is this the same republicans that ran the country from 2000 to 2006? Sound fiscal management and vibrant economy should NEVER be used in the same sentence with the word republican. Sorry to burst your bubble CNN, but your Libtard audience is not representative of America. Anyone who thinks that the GOP is good for the country now needs to have their head shrunk. These people would sign anything if it means another term in office, and the DEMS look like toothless old men. This country looks like its going to hell in a handbasket, and the GOP has their hands on the handle. Follow the money; who is funding the campaigns for the Tea Pariters and Right Wingers? Coke Bothers and big Oil ; Strategiizing and executing on tactics to en masse more power in the next election – ....first Lee Atwater – then Carl Rove and now Grover Norquist who came up with the idea of having Republican Congress sign a pledge of no tax increases prior to the Deficit Funding; BRILLIANT Political move. Evil Genius. it doesnt matter who is in congress we are being led by children and the fate of this once great nation has already been sealed, DESTRUCTION!!! The debt plan "scam" just proves it's pointless to belong to ANY party as a voter. If enough of us change our party affiliation to NPA, No Party Affiliation, then maybe they'll get the message that we're tired of the BS party "shell game" they keep playing with us. All of them need to be replaced – the House and the Senate!!! All!!!! None of them cared enough to give up a vacation. This is so important – so urgent! 1.Having more money, does not mean you have the right to more free speech, than those who are poor. That's just dictatorship of the rich and only leads to slavery, restricting rather than illustrating free speech. How can the Supreme Court be so stupid? If you require money, rather than your reputation to be elected, you probably shouldn't be elected, since the money will be used to create a false image rather than inform people of what you stand for. Past actions say so much more. So try running on them and see what happens. How much of that election money could solve the debt problem – tax it at 95% maybe... without loopholes? 2. Anyone who desires to wreck the presidents positive influence, and the country in that effort, to their own political gain, is what would normally be called a traitor, not a patriot. Those who have openly declared such intention, should be arrested and tried fairly, before being sentenced to the appropriate jail time. Just like others who openly threaten the president, those that openly threaten the nation for personal gain, should be guilty of just as grievous an offense, if not more. 3. Anyone who destroys the US economy by moving jobs to other countries or shipping in cheaper foreign labor, is destroying America's capability to support its armed forces, should any high intensity war break out; its also harming the ability to engage in any necessary low intenisity conflicts – note the malfunctioning foreign parts said to be found in our weapons systems today, or China's ability to hack our miltary systems with technology corporations have freely given to offshore. No army wins any long war without the support of a strong economy behind it – how strong can any economy be in time of war, when its manufacturing is offshored or outsourced and under the influence of foreign governments? Will we beat our enemies by selling their armed forces fast food, offering expensive health care to their wounded soldiers, or using other products of a "service" economy? 4. No one should take any oath that supercedes their oath of office. That should be obviously traitorous, and grounds for dismissal at the least. 5. Bankers and financial firms who scam the populace out of their money, must be treated like the common criminals they are, even and especially when they use several layers of business and outsourcing to raise the spectre of plausible deniability...or do we allow such to keep on happening? There's nothing wrong with honestly earning fortunes, but feeling "enti-tled" to profits no matter how you've mismanaged your corporation....really? These are the true false "enti-tlements" that need to end, not the ones people are truly entitled to because they paid their whole life for and earned them.. If America wants to continue spending TRILLIONS we have to borrow, great more andmore government entitlement prgams like Obamacare and end up in bankruptcy with rioting in the streets, then vote Democrat. If America wants to remain viable as a country with sound fiscal management and a vibrant economy, then vote Republican. The choice is clear and easy." This is the mantra on the right and unfortunately it is built on complete myth. It is repeated by the right like parrots and they don't even understand what they are saying. They keep talking about democratic spending and have no insight whatsoever on what money really is or how the economy works. I would add that economists have no idea how the economy works either. Most of what is going on is based on faith based economic principles stemming from neo-classical theories – Walrusian and Keynesian economic myths that have long since been rejected by the scientific community. Our economy is linked to the natural resources of this planet – it is what provides the regenerative capacity for goods and services. Most of the goods and services that stem from nature are disregarded as externalities by the mainstream faith based economists. It is like a huge religion – they even pass the collection plate (taxes) out to the masses. In reality they are destroying our collective weath (commonwealth) as a form of taxation by not properly disclosing the true value or even putting a price on the resources that we depend on. Biodiversity, for example, provides medicine, adds to our enjoyment, stems the spread of infectious disease, buffers against erosion such as major storms, creates soil and nutrients for food supplies, and filters our water. That is a truncated list – yet all those services from biodiversity are completely without set price. The government and industry can indiscriminately clear away at the land to set up a WallMart or new road at the expense of biodiversity that is in global decline. This creates an ecological segregation (eco-apartheid) between the rich and the poor. The rich gain monetary resources that can buffer against this ecological degradation. The poor have to live the with consequences and diminished access to the vital resources they need for survival. The British Medical Journal, for example, reports on the disparity of wealth in terms of access to green space – people with greater access to these natural areas have lower levels of mortality (decreased heart disease, decreased diabetes, and better psychological states). Yet these values are never accounted for in the modern faith based economic model of democrat or republican. Now here we are faced with the right winged simpletons – like the poster above – who want to distil this down to an overblown myth. The reality we are faced with is that we must elect democrat – even though it is far from a good option, but we must because the alternative is that we end up with real nut crackers on the right that will hasten our destruction. Much of what is happening now is very much like what lead up to the rise and fall of Nazi Germany. The right wing establishment in America is a perfect example of what brought the Nazi's to power. The Nazi's one on the basis of collective ignorance and here we are – history repeats itself. Am I the only one worried that the majority of the country wants to vote in 100% freshmen house members, after such a slim number of freshmen did so much damage? I agree that the tea party is rancid, but like another poster said, we need to be sure what the alternative really is before blindly voting all incumbents out.